The English Language Program was introduced – six years after the German Language Program – at Semmelweis University in 1989. Since then the number of students participating in the Program has been constantly growing. At the present time every third student of the University is foreigner, who arrive from five continents and 70 different countries. More than 1700 students conduct their education in English language, oversubscription is multiple. The popularity of the English Language Program indicates its recognition and the high-toned education increases the value of the Semmelweis diploma. 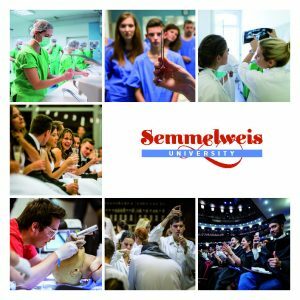 Diplomas issued by Semmelweis University are recognized by several countries (e.g. European Union – and with additional exams in USA, Canada and Israel). In the first two years the language of education is completely in English but from the third year students must have some knowledge of the Hungarian language as they are required to communicate with patients during their clinical module years. The study matters of the students in the English Language Program of the Faculties of Medicine, Dentistry and Pharmacy are managed by the English Secretariat. The curriculum in Medicine consists of six years of studies, in Dentistry and Pharmacy five years. At the conclusion of the programs the degrees granted in English and German are identical to those granted at the Hungarian program: Doctor of Medicine (dr. med. ), Doctor of Dentistry (dr. med. dent.) and Doctor of Pharmacy (dr. pharm.). The programs begin in early September each year. Semmelweis University is proud to have a truly international student community and famous for its bubbly student life, for instance the Semmelweis Carnival which is organized every year traditionally together with the Hungarian students or other programs for example the Freshman’s Day which helps the integration of foreign students.